On Sunday, March 15th from 12-2pm, join Left Coast Writers® Live on FCCFREE RADIO’s popular show, Lilycat on Stuff. Lilycat’s guest on Sunday will be Left Coast Writer® Marianne Lonsdale, author of the upcoming Three Mornings. Three Mornings follows a thirty-six-year-old woman, strong in her career skills and weak in relationship skills, navigate her first year with Paul, the man she thinks may be the love of her life, the man she wants to marry and have children with. Paul, a carpenter and singer-songwriter, is gorgeous, attentive, great in bed — and struggles with anger issues. They meet in Oakland in 1991 and the book follows the highs and lows of their first year together, as Nora lets her attraction to Paul override her doubts about him until an event happens that forces her to make a decision about their future together. Marianne will also discuss writing in community and the opportunities she started having when she was in the LCW Salon. In addition she will talk about Write On Mamas and the anthology they published, and the show Listen To Your Mother which she’s helping produce on May 9th. Marianne Lonsdale writes personal essays and short stories, and is now focused on developing a novel. 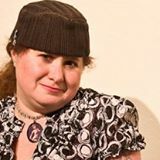 Her work has been published in the San Francisco Chronicle, Literary Mama, Fiction365, The Sun, and Pulse. She is a founding member of Write On Mamas, a San Francisco Bay Area writers group. Marianne has read at various events including San Francisco’s Litquake festival, and is honored to be an alumna of the Community of Writers at Squaw Valley. She lives with her husband, Michael, and son, Nicholas, in Oakland, California. The ongoing spot on Lilycat on Stuff is scheduled for the third Sunday of every month. Left Coast Writers® are invited to participate in the programming. Listeners are invited to call in and share their opinions. Add your voice to the fray by calling in during show hours: 415 829 2980. How to Listen in/Call in! Nice thing about these live casts – they’re incorporated into Pod Casts so you can go back and listen if the program played while you were out.